Another day, another O2 story to generate bags of coverage for. Which duly we did. Here’s an spot of creative thinking from Hope&Glory and the nice people at O2’s ad agency, VCCP. Along with the photographers, event boys and the lovely customers who made it all happen on the day. This week saw the launch of the all-new, all-sparkly Apple iPhone 5. We were challenged to make a mark and get people to associate the new handset with O2 – whether new customers shifting to a smartphone for the first time, existing customers who were upgrading or simply those in the market for a shift to the network with better value. 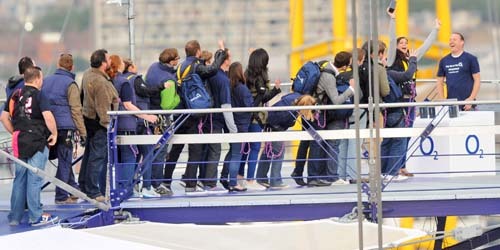 In response, we delivered a Pop Up Shop for the iPhone 5 on top of the mobile network’s most iconic asset – the O2 Arena. Branded “the most creative queue” of the day by none other than the Daily Telegraph’s Shane Richmond, we bagged coverage across the Daily Mail, Daily Telegraph, Evening Standard, Huffington Post, Pocket Lint, Digital Spy, T3 and a host of others besides. A good day altogether from the team in Hope&Glory.